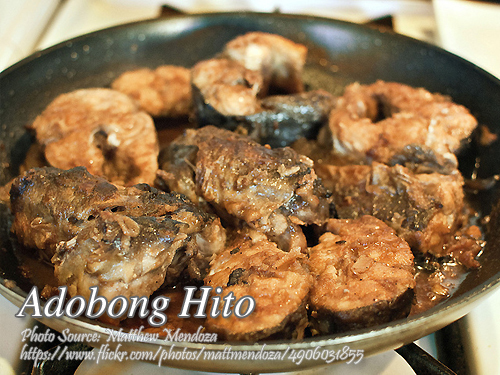 This is a simple recipe of adobong hito. Unlike other adobo dishes, this fish adobo does not have soy sauce. The combination of vinegar, ginger juice, garlic, salt and pepper is what makes this fish adobo differ from the usual fish adobo. And you will also notice in the procedure the proper way of preparing the catfish prior to cooking. Soaking the fish in vinegar for half an hour and rubbing it with sea salt will remove the strong fishy and muddy flavor of the catfish which is common to fresh water fishes. To cook adobong hito; In the market, have the head and gills of the fish removed. Also remove the internal organs of the fish and wash it well. Let stand in vinegar for 30 minutes, drain and rub with coarse salt till slimy coating is removed. Rinse in vinegar again then wash fish in water. In a bowl marinate the fish in garlic, ginger juice and enough vinegar to cover. Let stand for an hour. Drain and reserve marinade. Heat pork lard and fry fish until crisp. Remove fish from pan and put out excess lard. Pour in the marinade and bring to a boil, simmer uncovered till the vinegar evaporates. Add hito and continue cooking till oil is clear. In the market, have the head and gills of the fish removed. Also remove the internal organs of the fish and wash it well. Let stand in vinegar for 30 minutes, drain and rub with coarse salt till slimy coating is removed. Rinse in vinegar again then wash fish in water. In a bowl marinate the fish in garlic, ginger juice and enough vinegar to cover. Let stand for an hour. Drain and reserve marinade. Heat pork lard and fry fish until crisp. Remove fish from pan and put out excess lard. Pour in the marinade and bring to a boil, simmer uncovered till the vinegar evaporates. Add hito and continue cooking till oil is clear.